This entry was posted in computing, projects, tech, toys, zodiac. Bookmark the permalink. 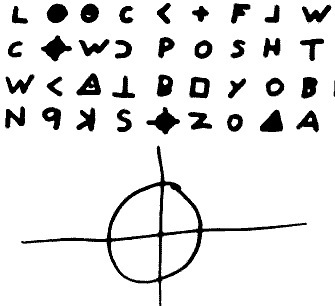 Ok, I just watched the new movie “The Zodiac” which left me wondering what all of his ciphers’ meant. They most likely have something to do with the people that he killed. I think that in each cipher he concludes how hard or how easy and what it really felt like to him. In the first solved cipher, he exactly states that man is the easiest game of all. Then he tells you what it was like or what it was better than. The question is not who is the Zodiac. The question is what is the Zodiac…..? I found some possible Zodiac cryptography. Interesting link, Zoa; thanks! Do you have any background information on that stuff?